However, unplanned pregnancy happens way more than you would ever imagine. In fact, 51% of pregnancies are classified as unplanned. When a situation like this occurs, often times the mother feels hopeless and doesn’t know where to turn for help. Two organizations in the River Region specialize in becoming a beacon of hope for not only moms to be, but also women who have had abortions and are looking for council. Sav-A-Life Montgomery began its ministry in 1982 and was originally classified as a pregnancy resource center. In the beginning, they provided women and men with free and confidential pregnancy testing and counseling by trained volunteers. In 2007, Sav-A-Life felt led to change the direction of their ministry slightly and began offering medical services. Such services included pregnancy screenings performed by certified nurses and ultrasounds. Because of this change, Sav-A-Life became known as First Choice Women’s Medical Center. In 2012, Sav-A-Life felt another calling from God to further expand their ministry and decided to offer parenting education programs for expectant mothers and their families. If the families participate in the classes, they are able to earn baby supplies and other items needed for a newborn baby, which they can pick out from an on-site store. Since First Choice Women’s Medical Center/Sav-A-Life opened its doors 34 years ago, it has been able to make a tremendous impact on many women’s lives in Montgomery and the surrounding area. All services offered are free and confidential to the expectant mothers. Some of the services offered are: pregnancy testing, ultrasound confirmation, peer counseling and emotional support, nurse consultation, HOPE Group: post-abortion recovery and support, parenting education, and material support of baby items. One of the greatest tools that Sav-A-Life has is the ultrasound machine. With this machine, they are able to show the mother her baby for the first time and allow them to bond. Often times, someone who is considering having an abortion changes her mind after being able to see the life that is being formed in her womb and hearing the tiny heartbeat on the monitor. Sav-A-Life could not make the impact it does today if it weren’t for the love and support from the community. They rely on support from churches, individuals, local foundations, family businesses and civic clubs. They are always grateful for any bit of help they receive. If you would like to make a donation of any amount please send to Sav-A-Life Montgomery, Inc., P.O. Box 241664, Montgomery, AL 36124. Visit www.savalifemtg.org. Also, they always need the help of volunteers, from peer counseling to receptionist to even running errands. If you wish to volunteer with Sav-A-Life you may give them a call at 334-260-8010 or stop by their location at 380 Mendel Parkway, Montgomery, AL 36117. Another wonderful organization in the area is River Region Pregnancy Center. They pride themselves on a judgement-free environment in which women can explore all of their options in dealing with unplanned pregnancy. All of the services at River Region Pregnancy Center are confidential and free of charge to the expectant mothers. The center is able to provide lab-quality pregnancy tests with results that can be given immediately. They also offer ultrasound services to allow the expectant mothers to get a first glance of the life forming in their womb. Not only does River Region Pregnancy Center offer medical services to the mothers to be, but also confidential pregnancy counseling. This compassionate service is something every expectant mother needs. It allows women to know they are not alone, and at this facility they are surrounded by loving and compassionate people who want to do nothing more than make sure they are taken care of and to see the same thing for their unborn child. River Region Pregnancy Center also offers services such as peer counseling, pre-natal classes, life skills classes, men’s support, post abortion support, and community referrals. River Region Pregnancy Center is located at 707 McQueen Smith Road S, Prattville, AL 36066. You can reach them by phone at 334-365-8266 or by text at 334-595-5668. 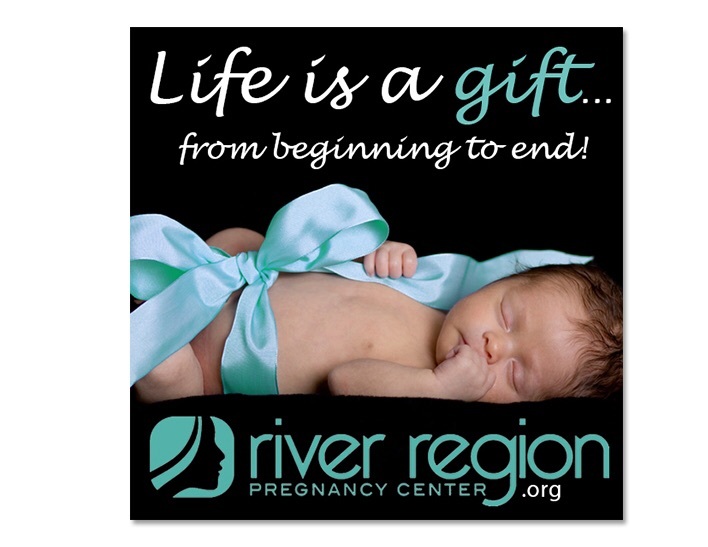 Visit online at www.riverregionpregnancycenter.org. The River Region area is very blessed to have not one, but two wonderful facilities such as the ones listed above to offer hope to women who find themselves in an unexpected pregnancy situation. Every life brought into this world is precious and loved by our God. Organizations like Sav-A-Life and River Region Pregnancy Center are designed to allow each and every mother who steps foot into their buildings to know that. These services could not be provided if it weren’t for the help of the community. Whether it be a small monetary donation, giving a few hours a couple times a week to go help around the facility, or even adding these centers to your prayer list, you can always make a difference. Mandy Pascal graduated from Troy University with a degree in print journalism. Read 1148 times	| Like this? Tweet it to your followers!